At a ceremony in Peace Plaza celebrating the establishment of the Japantown Community Benefit District are (from left) Mayor Ed Lee, Kristi Hiatt (daughter of the late Bob Hamaguchi), Supervisor London Breed, Sandy Mori and Todd Rufo of the Office of Economic and Workforce Development. SAN FRANCISCO — Leaders of San Francisco’s Japanese American community paid tribute to Mayor Ed Lee, who died suddenly on Dec. 12 at the age of 65. The San Francisco JACL said in a statement: “The JACL expresses its deepest condolences to his family – his wife, Anita, and his two daughters, Brianna and Tania. “Mayor Ed Lee was a dedicated and compassionate public servant for over 40 years, caring for his beloved City of San Francisco. A social justice advocate, his early years were spent as a civil rights attorney at the Asian Law Caucus, fighting for low-cost housing, tenants’ rights and other social justice issues. He would later head various city departments, among which were director of the Human Rights Commission, director of Public Works and then as city administrator from 2005. The San Francisco Japantown Task Force said in a statement, “Mayor Lee has been a strong advocate/loyal supporter of Japantown — as the head of the Department of Public Works, as the chief administrative officer, and as our mayor. “In his first term, he designated Japantown as one of the first 25 San Francisco neighborhoods as part of his Invest in Neighborhoods program. His sensitivity to the importance of the cultural and economic development aspects of Japantown was exemplified by his support for the many nonprofit organizations, the churches, the festivals, the merchants, and the property owners. 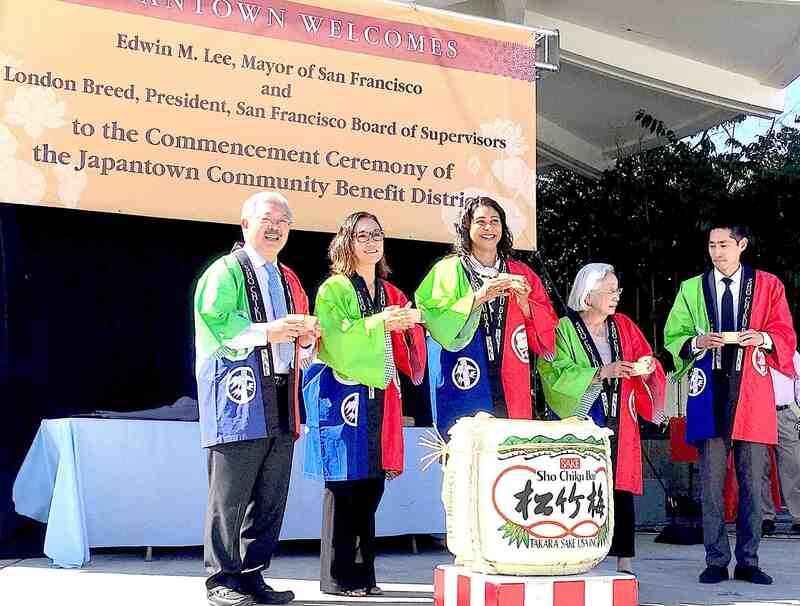 “His last appearance in Japantown was at the Peace Plaza on Sept. 27, 2017 when he and District 5 Supervisor London Breed honored our late executive director, Bob hamaguchi, and celebrated the formation of the newest Community Benefit District in San Francisco, the Japantown Community Benefit District. 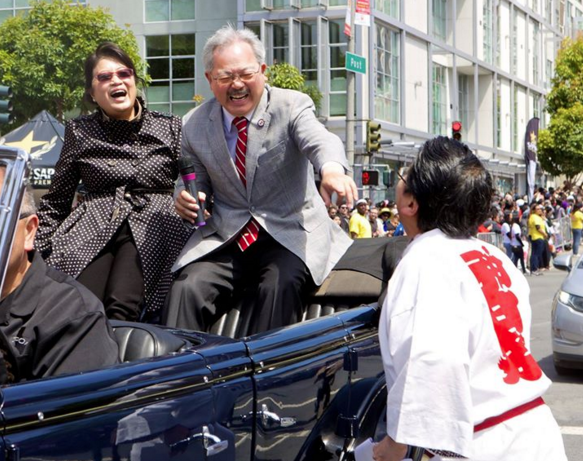 Mayor Ed Lee and his wife Anita were regulars at the Northern California Cherry Blossom Festival’s Grand Parade. Breed, whose district includes Japantown, has been named acting mayor. Serving on the Japantown Task Force’s board are Sandy Mori (president), Glynis Nakahara (vice president), Mark Moriguchi (treasurer), Judy Hamaguchi (secretary), Seiko Fujimoto, Richard Hashimoto, Alice Kawahatsu, Benh Nakajo, Jon Osaki, Beau Simon, Neal Tanicuchi, Clint Taura and Rosalyn Tonai.